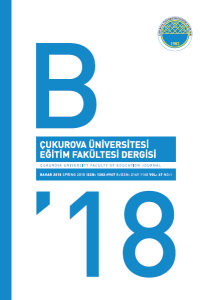 C.U Faculty of Education Journal is a refereed academic journal, which publishes quantitative and qualitative research on current issues in all fields of education. Additionally, some of the critical and up-to-date topics related to education that are discussed from the theoretical perspectives, and the results of the practical studies are also published in the journal. In this context, original works of qualitative, quantitative and mixed-method studies of different fields of education (educational sciences, foreign languages ​​education, social science and Turkish education, fine arts education, basic education, science, and mathematics education, computer and instructional technology education and special education) are being published. It is expected that the studies to be accepted in the journal should provide new and unique contributions to the theoretical and practical aspects of education. The language of the journal is Turkish and English. English versions of articles must also be submitted once the submitted articles in Turkish are accepted for the publication in the journal. The author (s) are required to make proofreading for the English version. Articles initially written in English are also accepted for the submission. The works prepared in Turkish are evaluated for the publication in the journal, and accepted articles are published both in English and Turkish. While preparing the English version of the work, proofreading for grammatical structure, expressions, meaning and fluency should be carried out by someone with a native or near native competence in English. When the studies prepared originally in English, it is also required that the authors submit the Turkish version of the text when it is accepted to be published. The CU Faculty of Education Journal publishes qualitative, quantitative and mixed method research in current issues of educational studies as well as theoretical discussions of recent critical issues in education and practical applications that suggest models. The works to be submitted should not have been published elsewhere or have been submitted to another journal at the same time. The work to be submitted to the journal should only be uploaded to the 'application registration' section at http://dergipark.ulakbim.gov.tr/cuefd/author/submission. Papers sent to CU Faculty of Education Journal should be prepared according to the rules stated in Publication Manual of American Psychological Association (APA) (6th Edition) published by American Psychological Association in terms of in-text citation and bibliography editing. Also referencing and bibliographic editing principles that can be found in website of the journal should be consulted. Papers sent are firstly analyzed in originality (ithenticate) program by the editor, then papers having originality reports with 15% and below are sent to field editor by taking research topics into consideration. In this process field editors send papers to two referees being experts in their field. In case of a difference between the views of two referees, papers are sent to another referee for the third review. Referees are given one month for their review. When this time is exceeded, a reminder letter is sent. Therefore, review process of referees may sometimes take longer time than a month. Besides, the process of assigning referees by field editors for the preliminary reviewed papers by the editor take about 20 days. In the article evaluation process double blind review system is utilized. Author(s) do not know who the referees reviewing their paper are, and referees do not know who the author(s) of the paper that they review are. Author(s) are supposed to take criticism, suggestions and correction requests of referees, field editors and the editor into consideration. Author(s) should also send an explanation regarding whether they have made requested changes and corrections and how. Publication fee is not requested for the accepted papers and authors and referees are not paid. Editor may decide on accepting the paper according to the results of referee review reports, reviewing after corrections and changes that referees specified completed or refusing the paper. For detailed information on referee review processes and evaluation principles notes for referees section can be visited. Referee reviews are sent to authors of the papers that are accepted for publication. Papers that have been sent to editor upon completing changes and corrections are prepared for typesetting and design process. Papers, typesetting and design process of which have been completed, are sent to authors for control one last time. Detailed information about style and format of the papers which will be sent to the journal for evaluation process is in the template file. Author(s) can edit their papers according to that template file. In the study, font type Times New Roman, font size 10 and 1 (one) line spacing should be used. The title’s font size should be 14, it should be centered, and initial letters are required to be uppercase. Turkish title is supposed to be written above Turkish abstract, and English title is supposed to be written above English abstract. Turkish and English abstracts are required to be in font size 10, between 150-200 words; in addition, key words should be between 3-5 words. The whole text is supposed to be in one column and justified. Each paragraph’s carriage return should indent five-seven characters. The words should not be hyphenated at line breaks. Paper margins for left, right, top, and bottom should be 2,5 cm. The paper edited in according to template should not exceed 7000 words. The paper should consist of introduction, methods, findings, discussion, and conclusion sections. If the study is empirical, under the section of methods participants/study group/sample, data collection tools and data collection process subtitles should be included. The title of the study and main headings (Methods, Findings, Discussion and Conclusion) are written in justified and bold format. Second-level headings are written flush left and bold. Third-level headings are written flush left, bold, and with five-seven characters indent. Only the first word’s initial letter is uppercase, the rest continues in lowercase. Fourth level headings are written flush left, bold, italic, and with five-seven characters indent. Only the first word’s initial letter is uppercase, the rest continues in lowercase. Fifth-level headings are written flush left, italic, and with five-seven characters indent. Only the first word’s initial letter is uppercase, the rest continues in lowercase.